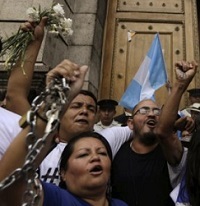 HomeArchivesBoliviaWhat’s Behind the Bolivian Government’s Attack on NGOs? As the NGOs and their defenders have noted, far from advancing an imperialist agenda and undermining national sovereignty, these organizations have consistently championed the interests of Bolivia’s most disadvantaged sectors and challenged government policies that privilege foreign entities. The fraught relationship between the government of President Evo Morales and Bolivia’s NGOs took a turn for the worse this past August, when Vice President Alvaro García Linera launched an attack on four well-respected Bolivian research organizations: the Center for the Study of Labor and Agrarian Development (CEDLA), the Bolivian Center for Documentation and Information (CEDIB), and the Tierra and Milenio Foundations. The episode has set off a firestorm inside and outside Bolivia, raising important questions about national sovereignty, the erosion of democracy, and the prospects for continuing debate around Bolivia’s extractivist development model. The four NGOs, which have conducted important investigations on economic, social, labor, environmental, and agrarian issues in Bolivia for more than 25 years, are accused of “lying and political meddling” to advance the interests of foreign governments and corporations. Specifically, says García Linera, they are using funds from abroad to promote a “transnational imperial policy” of environmental protection, in which countries of the global south forego opportunities for development and become “park rangers” for the benefit of the industrialized north. According to local media outlets, Garcia Linera also threatened the four Bolivian NGOs with expulsion from Bolivia. In an open letter to García Linera on August 13, 42 prominent leftist intellectuals from Latin America and elsewhere denounced the charges as an “enormous setback for Bolivian democracy.” Among the signatories were many current and former supporters of the Morales government, including Portuguese sociologist Boaventura de Sousa Santos, Uruguayan political commentator Raúl Zibechi, French journalist Hervé do Alto, and Mexican mathematician Raquel Gutiérrez (Garcia Linera’s former compañera). In a written response on August 18, García Linera denied—or retracted, according to his critics—any intention to close, expel, or restrict the activities of Bolivian (as opposed to foreign) NGOs. Still, he has continued to attack the four organizations as “fronts” for geopolitical imperialism, expounding on his thesis—first articulated in his 2013 treatise Geopolitics of the Amazon— that NGO environmental activism promotes neocolonialism and threatens Bolivian sovereignty. 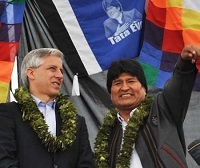 Historically, NGOs working with Bolivia’s social movements were instrumental in bringing Morales and his MAS (Movement Towards Socialism) party to power, and have been an important source of leadership recruitment for the Morales government. At least 50 current and former high-ranking government officials (Chancellor David Choquehuanca and Minister of Government Carlos Romero among them) have risen through the ranks of NGOs, including the four now under attack. García Linera himself was an unsuccessful candidate for the directorship of CEDLA in 2004. Relations between the Morales government and pro-environmental NGOs have been strained since the TIPNIS controversy in 2011, when many NGOs weighed in on the side of lowland indigenous resistance to the government’s proposed highway. In December 2013, the Danish NGO IBIS was expelled from Bolivia for presumed political interference, after 30 years of work with indigenous organizations on land reform, bilingual education, prior consultation rights, and related issues. Under a new law adopted in 2013, all NGOs operating in Bolivia (both foreign and domestic) must renew their registration with the government, reveal their funding sources, and conform their statutes to official purposes. The government has broad powers to dissolve them without a judicial process. While the new law (whose constitutionality is being challenged by Bolivia’s Ombudsman) has not yet caused any NGO to lose its legal standing, critics say it has created an atmosphere of fear and self-censorship. To date, only 250 of Bolivia’s 2,176 NGOs have successfully completed the protracted registration process, and most of these are financial institutions or low-profile civil society organizations affiliated with the government. Of the four NGOs currently under attack, only one (Fundación Tierra) is registered. The others continue to operate in a kind of legal limbo, which heightens their sense of political vulnerability. The current NGO controversy has arisen amidst escalating tensions between the Morales government and indigenous, environmental, and civil society organizations that have challenged Bolivia’s growing dependence on an extractivist development model. In particular, these groups have opposed Morales’s new initiative, announced last May, to expand gas and oil activities into Bolivia’s national parks, which are protected under the Bolivian Constitution as ecological reserves. Many of these reserves are collectively titled to indigenous groups who have inhabited them for centuries, relying on their ancestral lands for subsistence. The sense of urgency to expand the hydrocarbons frontier is driven by the dramatic decline in international oil prices (which also lowers the market price of Bolivia’s gas). Morales is also promoting a vision of Bolivia as South America’s “energy hub,” with fuel and electricity exports to neighboring countries—beyond Brazil and Argentina, which already receive 80% of Bolivia’s gas—seen as crucial to that objective. On July 21, Morales announced that his government will “aggressively pursue” oil and gas activities in 7 of Bolivia’s 22 national parks, in conjunction with transnationals like Brazil’s Petrobras, Spain’s Repsol, and France’s Total. Since the “nationalization” of hydrocarbons in 2006, these companies have operated in Bolivia through joint ventures with YPFB, the state energy company. While the companies must comply with environmental remediation and community consultation requirements, and contribute 1% of their investment towards poverty reduction in the affected region, critics say these measures won’t begin to compensate for the true costs of oil and gas extraction. The four NGOs that are under attack have been in the forefront of these recent debates, contributing significantly to the critique of extractivism. For example, CEDIB has documented the extent of existing oil and gas concessions in protected natural areas, as well as deficiencies in recent community consultation processes. Fundación Tierra has investigated changes in government agricultural policy that favor agribusiness interests, limit opportunities for land redistribution, and contribute to the marginalization of peasant farmers. 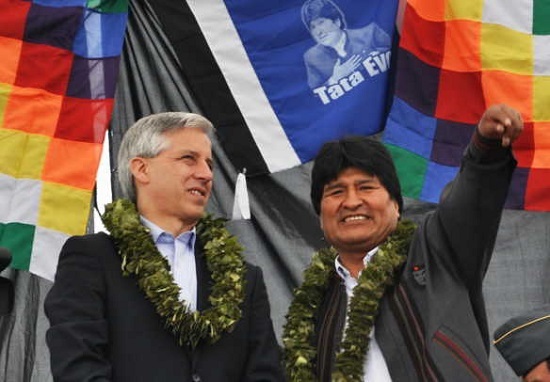 As the NGOs and their defenders have noted, far from advancing an imperialist agenda and undermining national sovereignty, these organizations have consistently championed the interests of Bolivia’s most disadvantaged sectors and challenged government policies that privilege foreign entities. The future of Bolivia’s development model is a critical issue about which much debate is needed, with strong arguments on both sides. On the one hand, the Morales government has been enormously successful in maximizing revenues from natural resource extraction and using them to finance development, infrastructure, and anti-poverty initiatives that have significantly improved the lives of ordinary Bolivians. In a country where gas is viewed primarily through the lens of resource nationalism, this model has widespread popular support—as evidenced by Morales’s landslide (61%) electoral victory last October, supported by a broad coalition which has substantially benefited from Bolivia’s gas-fueled prosperity. The government also defends its extractivist policies as a necessary means to create the resources for a post-extractive economy that will transition towards “communitarian socialism” in the future. Still, an increasing number of voices in Bolivia argue that the wealth generated by relentless extractivism has come at too great a cost, damaging the environment and affected communities, perpetuating a dependency on transnationals, and obscuring the need to develop a more sustainable economic model sooner rather than later. An additional risk is the erosion of democracy—as exemplified by the attacks on NGOs that raise critical questions, challenge assumptions, and seek to deepen the ongoing debate. As the contradictions of Bolivia’s extractivist development model intensify, so will the social conflicts they generate. A case in point is the recent controversy in the Guaraní community of Takovo Mora, where protesters demanding the right to be consulted about an extractive project on disputed lands were met with tear gas and a violent police raid on the village where they sought shelter. Only by allowing—and not suppressing—these varying expressions of criticism, dissent, peaceful protest, and even resistance can the limits of extractivism be defined in a progressive democratic society.